an event we do every year is coming this week. we call it wet n wild wednesday. 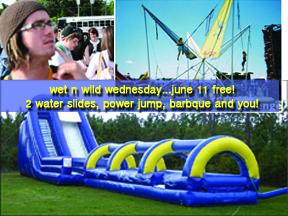 we rent 2 60′ water slides, a power jump, barbque hamburgers and have a wet n wild time wit hundreds of students…i love this week! this night does cost some dough to put on…but isn’t this why we do what we do? it’s all about the students! This entry was posted in youth ministry and tagged services, students, youth church by altheforce. Bookmark the permalink. hi al don’t become too water soaked … yes you are right its the end result that matters. this is just a means to an end and you have an end in sight which is the important thing. hope all goes well. Can we come from Miami? lol! !